Ceramic material can be described in terms of the components and how they are arranged : this is the FABRIC of the ceramic. Facbric can be described after examination with a magnifying glass or microscope and recorded for analysis. One can work back from analysis of sherds and draw up a recipe for how to mix a clay to copy an ancient fabric. The way fragments in the fabric are arranged can give clues as to wether the pot was turned, made with coils etc. 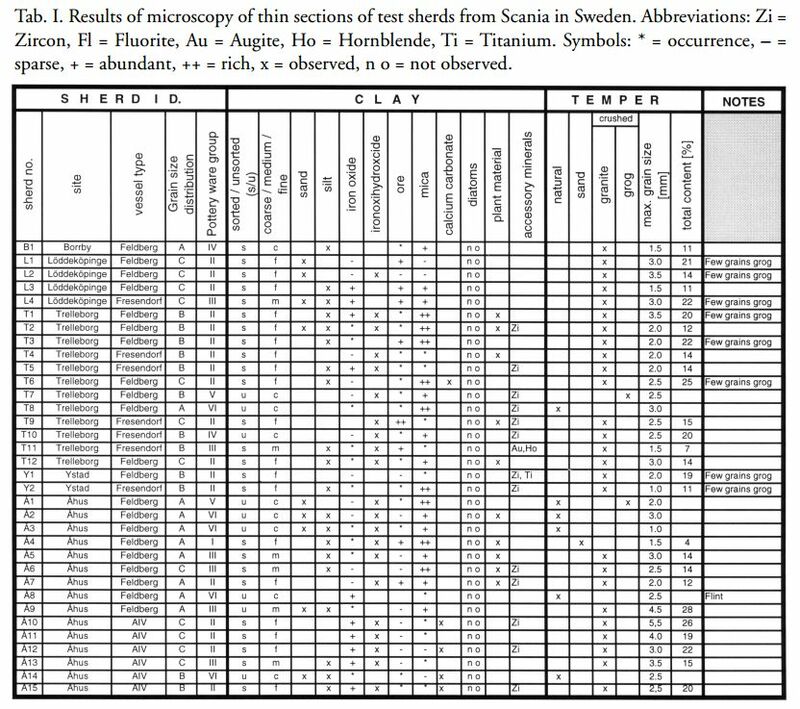 This table gives, as an example, analyses of Viking Age pots from Skåne. The clays can be differentiated by mineral content. One can see at right the size and %ages of coarse, non-clay fragments. - temper. It can be seen how these often correlate with the pot's type.